I got this email over the weekend. If it wasn’t so sad, I would have to laugh. Obamacare means never having to worry about getting sick and running up against a lifetime cap on insurance coverage. It gives parents the comfort of knowing their kids can stay on their insurance until they’re 26, and that a “pre-existing condition” like an ear infection will never compromise their child’s coverage. It’s about ending the practice of letting insurance companies charge women 50 percent more — just because they’re women. And Obamacare can save seniors hundreds of dollars a year on prescription drugs — and gives them access to preventive care that is saving their lives. President Obama never lost sight of the fact that this reform is about people. People like his own mother, who spent the last years of her life fighting cancer — and fighting with insurance companies, too. That shouldn’t happen. And because of Obamacare, it can’t. So next time you hear someone railing against Obamacare, remember what they’re actually saying they want to take away. P.S. — Side note: Can you imagine if the opposition called Social Security “Roosevelt Security”? Or if Medicare was “LBJ-Care”? Seriously, have these guys ever heard of the long view? Just before President Obama’s national health care law passed in March 2010, I created a chart to visualize how Democrats had delayed implementation of the major spending provisions until 2014, so that 98 percent of its $940 billion projected cost came in the last six years of the Congressional Budget Office’s 10-year budget window. This allowed Democrats to claim the legislation met Obama’s pledge that the law would cost “around $900 billion over 10 years,” even though the true cost was far higher. Yesterday, the CBO released new projections from 2013 extending through 2022, and with the shifted timeline, the ten-year cost of the law’s core provisions to expand health insurance coverage has now escalated to $1.76 trillion. So I’ve created the updated graph below. Notice how low the numbers are in the 2010 to 2013 time period and how they quickly soar. 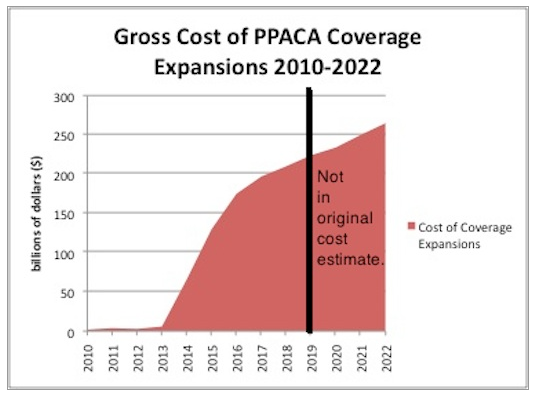 All the spending to the right of the black line wasn’t reflected in the CBO’s estimate for the Patient Protection and Affordable Care Act (PPACA) at the time of passage. ABC News’ Tahman Bradley reports: The country’s benefit programs for the elderly – Medicare and Social Security – will be exhausted sooner than thought due to the economic downturn, the Social Security and Medicare Boards of Trustees said today. Medicare’s Hospital Insurance Fund is projected to exhaust its funds in 2024, five years sooner than last year’s estimate, and Social Security will be exhausted in 2036, a year earlier than previously thought, the trustees announced. Let’s not forget that Obama’s payroll holiday further weakens Social Security and Medicare. This is in addition to the $500 billion in cuts to Medicare in Obamacare. 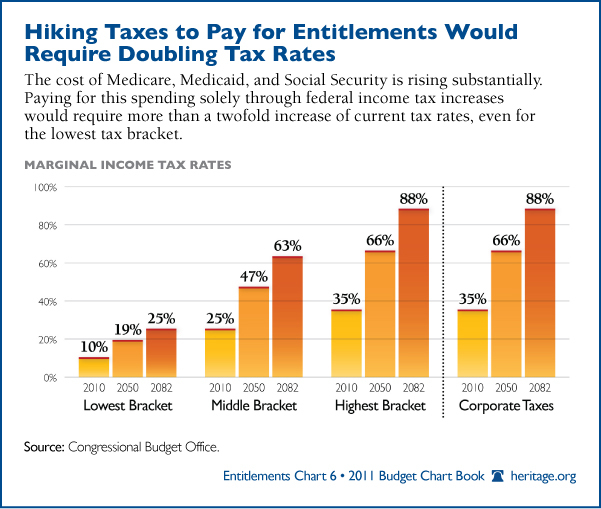 I agree with Axlerod putting Obamacare in the same class as Social Security and Medicare . They are budget busters that are/will be budget black holes. Until Liberals in Congress realize that doing nothing will result in the slow death of Social Security and Medicare, we will continue to dig their graves. 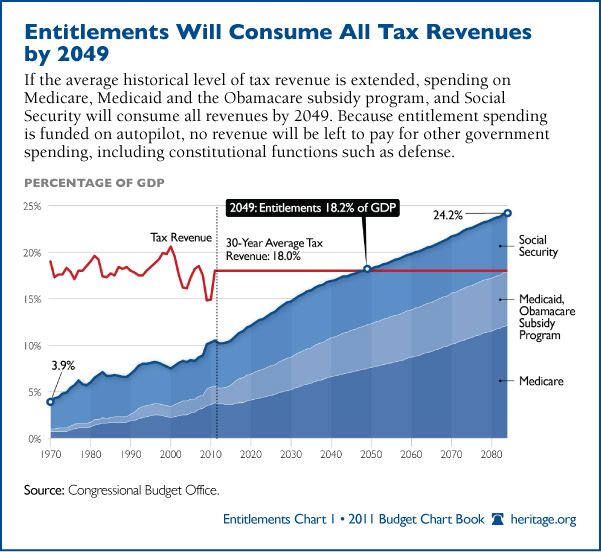 Obamacare just makes it much more difficult to get our budget in balance and begin to reduce our growing national debt.